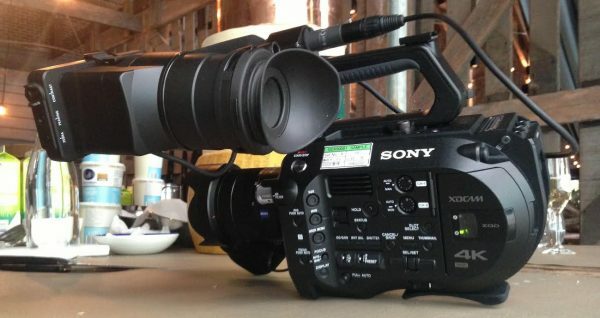 I recently got my hands a prototype Sony FS7 for a whole weekend of shooting. I had no restrictions from Sony was really able to put it through its paces. With Director Clara Chong, my creative partner at The Film Bakery, we decided that we wanted to make a mini-doc film complete with interview and overlay footage that included both controlled shots and following the action. 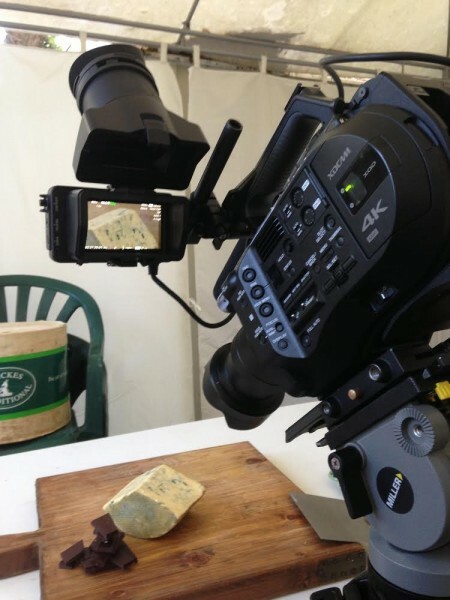 The Cheesemonger – FS7 Camera Test Project from Ben Allan ACS on Vimeo. Sadly there were no samples of the new E-mount 28-135mm cine-style zoom in Australia, so instead Sony supplied the camera with a Zeiss 24-70 f4 E-mount SLR lens. This is a lovely lens but suffers from the common limitations of autofocus stills lenses for shooting moving images – there is no iris and manual focussing is tricky. Sony’s Nick Buchner also supplied a Metabones EF adaptor so that I could use any of my Canon SLR glass. We coordinated with our friend Claudia McIntosh Bowman to shoot a little profile of her. She has the unusual occupation of cheesemonger. With only 24 hours to prep, Clara researched ideas for shooting cheese and came up up with a visual style and structure. I had only a couple of hours with the camera before we had to start shooting Claudia presenting a cheese-making workshop in the beautiful Rushcutters Restaurant. Luckily the FS7 menu system is very similar to the F5/55 system and as someone familiar with those cameras, I had virtually no learning curve. To shoot in the restaurant I used a minimal handheld kit. No tripod, no lights and no assistant. The FS7 is obviously heavily influenced by Aaton’s famous ‘cat-on-the-shoulder’ camera design of the film era. In the past I spent a lot of time shooting film with the XTR-Prod and the diminutive A-Minima and I do love their design and operation. It is worth noting that the FS7 (certainly without the extension unit) has more in common with Aaton’s A-Minima than the LTR/XTR line that gave rise to the ‘cat-on-the-shoulder’ analogy. Even though the FS7 is about the same size and weight as the A-Minima it isn’t quite as comfortable, but it is nonetheless very effective at getting good handheld footage. Once I got shooting in the restaurant, the low profile and manoeuvrability came into their own. For the interview we decided to shoot in Claudia’s New York-style inner-city apartment. Low ceilings, small rooms, white walls and mixed colour temperatures make what to the eye is a charming space into huge challenge for a camera and cinematographer. The FS7 is just as much at home on a tripod as handheld. The interview was shot on sticks and the FS7 operation became ergonomically quite similar to the F5/55. A design feature I love is the large, dedicated record trigger positioned near the front of the operator’s side of the camera – it is easily accessible either when shooting handheld or on tripod. Panavision and Arri film cameras have used similar positioning for a long time and it works. The other big test in the interview was a section of white wall in the background that we would inevitably want to darken with a grad in DaVinci Resolve. Sony’s XAVC codec was amazing at handling this situation because the clever encoding of the 10-bit format meant that we could darken beyond what we wanted without seeing any banding or blocking. For the controlled shots of the different cheeses we wanted to test the higher frame rates. As with the F5/55, the maximum frame rate in the 50Hz world is limited to a lower rate than it is when using the camera with a 60Hz base. This means a maximum of 150 fps for PAL instead of 180 fps in NTSC mode. That said 150 fps is a great speed for doing macro shots of food and we were pleased with the movement we were able to capture without having to switch to NTSC. In the high frame rate mode I noticed an increase in noise in darker colours. It’s not clear whether this was a prototype issue, or a design issue. It will be interesting to revisit this with the production model. If it is a design issue I wouldn’t call it a deal-breaker, but certainly something I would bear in mind when shooting. Another trick I tried while doing the food close ups was shooting at minimum focus in 4K (UHD) mode and then cropping in post to get closer. I was very pleased with how well this worked, effectively halving the minimum focus distance of a lens if finishing in HD. For post workflow Clara edited the XAVC footage natively in FCP X. Taking an XML out of FCP X and into Blackmagic’s DaVinci Resolve meant that we could also grade directly from the camera original files. This process was as seamless as I can imagine – grading the SLog-3 material in Resolve 11 was thoroughly enjoyable. I graded under a look up table (LUT) on the final node, so that I could use a different LUT for the interview than the rest of the footage. There was no logic to this decision, it just seemed to work so I ran with it. With only what’s in the FS7 box, you can be up and shooting handheld in minutes. The level of comfort and stability is as good as any Scarlet, C300 or F5 with a well thought out rig (but without the expense). The FS7 is an exciting camera that fills a current void in the market and shows how much Sony are listening to their users. Sony had the express aim of creating a documentary style camera the FS7, but it will also have much broader applications. The picture quality, range of shooting options and flexibility of operation is astounding at the price point.